The first version appeared in Steven's Window, a column in The National newspaper of Papua New Guinea. Date: 12th February 2010. Charles Dickens remains one of the most influential British writers of all time in many corners of the world, including ours, as revealed in an award winning novel: Mister Pip by Lloyd Jones. “I have tried to describe the events as they happened to me and my mum on the island. I have not tried to embellish. Everyone says the same thing of Dickens. They love his characters. Well, something has changed in me. As I have grown older I have fallen out of love with his characters. They are too loud, they are grotesques. But strip away their masks and you find what their creator understood about human soul and its suffering and vanity. When I told my father of my mum’s death he broke down and wept. This is when I learnt there is a place for embellishment after all. But it belongs to life—not to literature”. This is the voice of Matilda, a young Bougainvillean lass, researching her Masters thesis on Charles Dickens in England. Matilda Laimo is a fictional character in Lloyd Jones’s novel: Mister Pip (2006), published by the Text Publishing Company of Melbourne Australia. The novel went on to win the Commonwealth Writers’ Prize, Japan’s Kiriyama Prize, Montana Deutz medal and was shortlisted for the Man Booker Prize. Matilda Laimo’s story began during the Bougainville Crisis of the early 1990s. Matilda grew up in the middle of the civil war where men had gone into the jungle to join the rebels or had been killed in the conflict. Matilda and her mother Dolores Laimo lived through the Crisis to experience the darkest moments of her life. Matilda’s father lives in exile in Townsville, Australia. The other important character in the book is Mr. Watts, the only white person, the self-appointed teacher of the tiny primary school where the only textbook is the Dickens novel Great Expectations. Mr. Watts teaches the children about their lives through the word, lines, and images painted by Charles Dickens during the Victorian era in England. Dickens’ world came alive for the young children in Mr. Watt’s class. In the beginning of the novel Matilda tells us about the background of her own life narrative in Bougainville: “during the blockade we could not waste fuel or candles. But as the rebels and redskins went on butchering one another, we had another reason for hiding under the cover of night. Mr. Watts had given us another world to spend the night in. We could escape to another place. It didn’t matter that it was Victorian England. We found we could easily get there…By the time Mr. Watts reached the end of chapter one I felt like I had been spoken to by this boy Pip. This boy who I couldn’t see to touch but knew by ear. I had found a new friend.” It was Pip who captured all her imaginations as Matilda lived through the ordeal before coming out to tell her story about that experience and the influence Mr. Watts, Mr. Pip, and Charles Dickens have on her life. The word embellishment as used in the book captures my attention. Matilda talks about embellishment towards the end of the book. Embellishment is a noun, meaning adornment or enrichment. Adding ornaments or decorations to increase beauty of something is one meaning of the word embellish. Another meaning is to add false details to something by making an account or description more interesting by inventing or exaggerating details, and in the context of music adding ornamentation to melody such as extra notes, accents, or trills to a melody to make it more beautiful or interesting. Matilda declares that embellishment is more true to life than it is to literature. Embellishment is the outcome of adding something to enrich what is already present. Matilda grew up with the wondrous and exciting world of Mister Pip as embellished by Mr. Watts. Matilda discovers the place of embellishment in life in her search for the world described to her by Mr. Watts through Charles Dickens’ book. She comes to the shocking conclusion that Mister Pip’s England was never that fantastic, magical, and the fairytale world, but one which went through periods of defining moments that shaped its contemporary history. Mister. Pip’s world was stark, harsh, plain, and grim. Dickens capitalized on that experience for most of his fiction, revealing nothing of the future that England would become. Mr. Watts, the self-appointed envoy for Charles Dickens and the bearer of Western knowledge, stubborn enough to risk his own life for the Bougainvilleans, was caught up in the armed conflict between the PNG government and Bougainvilleans. He had a lot to do with the embellishment of Charles Dickens’ world that Matilda grew up as a child to believe in. 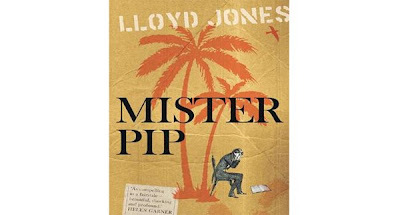 In much the same way The Great Expectation was a window into the world of Mister Pip I think of Lloyd Jones’ Mister Pip as a window into the world of Matilda, her people, and Mr. Watts’s, during the Bougainville crisis. Matilda’s escape from the dangers of the Bougainville conflict to Australia provides us a window into one of the defining moments in our history. She joins up with her father in Australia and grows up in exile from her country. Matilda’s discovery, that embellishment belongs to life rather than literature, is our observation of life. We need also to ask how embellishment might have anything to do with our lives. Embellishment occurs the moment we adorn ourselves with underserved titles and appear powerful. Others accentuate self-importance without demonstrating the solid foundations for such titles and offices they hold. Still others make themselves look so big without evidence of productivity, progress, or substance. Our society is now saturated with such people. Striping away their masks would reveal their emptiness, hollowness, and a magnitude of fictitious lives. At least that is one thing I learnt from reading Lloyd Jones’ Mister Pip, which gave me a new sense of appreciation of the works of Charles Dickens. My teacher used this on our exams today and i just had to follow up on this blog. I hope to write books one day and your work is really inspiring in a way. I especially love how you defined embellishment. It makes me understand, connect and relate the word to a lot in life and my views. Thank you for sharing this. Appreciate it.